"So I am new here and I actually joined to write a review for a phenomenal Luthier and the amazing instrument I just purchased from this easy going, friendly and helpful gentleman. "I bought a concert size resonator uke from Russ Morin also known as Big Rusty Ukuleles and I couldn't be happier. I fell in love with the depth of sound coming out of his youtube recordings and I talked to him extensively, (his patience is amazing... I can be annoying.) In any event, I eventually decided to go with it. "Body, neck and resonator cover are solid magnolia. Fretboard is spalted dogwood and it has a slight (20') radius. Fretboard markers are holly. Truss rod is square steel rod. Tuners are Gotoh Deluxe friction tuners. Nut is African Blackwood. Cone is National.Scale is 15". "Now, he sent it with the warning that it is his prototype and is no beauty queen, along with a couple of other odd cosmetic flaws due to being his first resonator. The cone doesn't quite match up with the cover. Cosmetic only. The action is slightly high at the 12th fret which I haven't actually noticed. "He finished it with an effort to give it that old worn painted body reso-look and I have to say he did it beautifully. The overall effect is that of a painted body uke that has worn smoothly enough to allow the gorgeous wood grain underneath to peak out. I really like it. "Soundwise, I am absolutely blown away. As a guy with a gruff slightly gravelly lower range and a big but piercing upper register, I was really looking for a reso with enough body to keep up with my voice. This one does it and then some. Russ said that there's a cork gasket on the cone and that that's why we are guessing that it has the big throaty sound that it has. 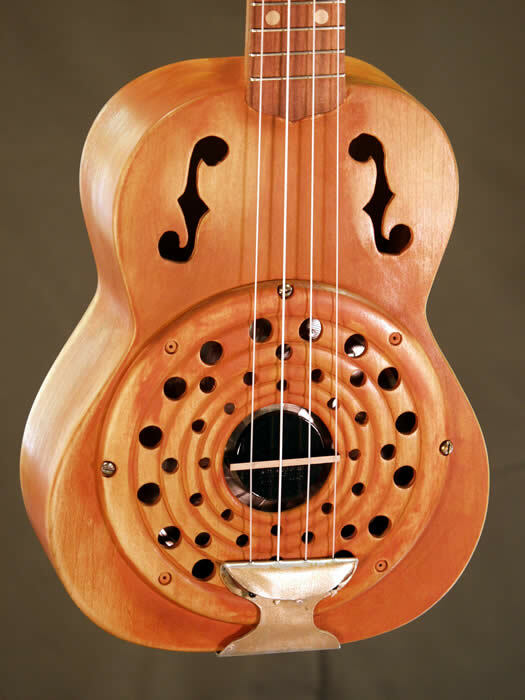 It isn't the thin, tinny sound that you get out of a lot of reso-ukes, but it is rich, full bodied and doesn't lose any of the metallic bite that I look for in of a resonator. "I played a 4 day gig last week with my band and we got booked in a suite with another duo who we play with regularly. Inevitably it got passed around throughout the 5 of us who play uke or strings of some type, and it got rave reviews all around, including one of the guitar players in my band who I tend to think of as ocassionaly being a, "hyper critical jerk." I was actually expecting some ridiculing from him for buying any other resonator than a national, and I was shocked to see how much he kept complimenting its sound, looks and playability. "There is only one criticism that I would make, and that is my personal dislike of friction tuners. I think that, as a general rule, to consistantly maintain effective tuning without spending an inordinate amount of time monkeying with them you should either have fine tuners like you would get on a violin, or you should switch to geared tuners, which I am planning on doing. "Tuners aside, I couldn't be any happier with my instruments sound, looks and overall quality, on top of Russ being a friendly, easy to get along with, and just darn helpful gentleman." "last night yer axe *blew away* 30-odd peoples. i'm talkin' *BLEW* away so big time! you're on to some good karma walkin' your way, brah! when i take it to next uke club, you gonna be *the* man! now all we gotta do is revamp the economy so folks can have some more discretionary income...you totally ROCK!!!!!! "Played Mad Dog/old smelly bob's new tenor he brought to UCSC last nite. Huge sound, beautiful workmanship. Morrin will be somebody to watch (and support.) I want a soprano!" pick it up and inquire who built it)." 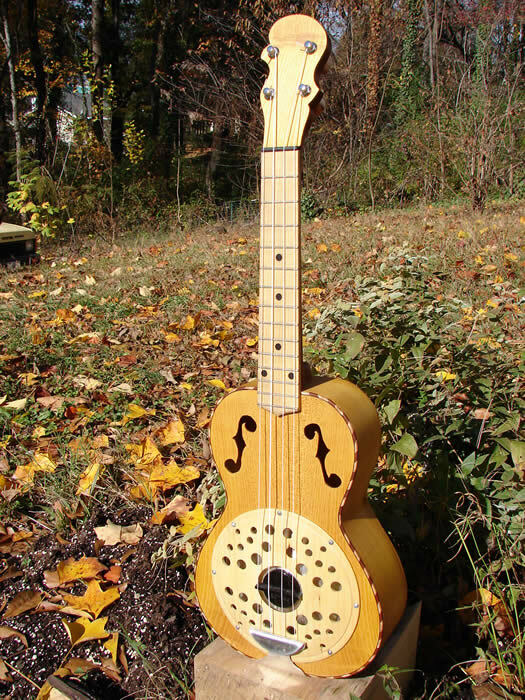 We have had the Lone Star Uke Fest here in Dallas the last couple of days, and the osage orange resonator sure turns heads. Instructors Pops Bayless and Bob Guz each took the uke for a test drive. And many folks attending the event quizzed me on who built that stunning uke."